Wyman Plumbing is a hometown plumber. We are not a national franchise company, and we do not flat rate and expect you to pay higher rates for the what “if’s”! We strive to give our customers great service, quality products and parts at a reasonable rate. So when you need a plumber, you need Wyman! See what some of our customers have had to say about their experience with Wyman Plumbing. 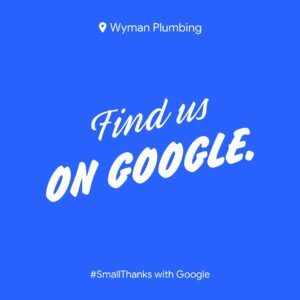 These and many other Google Reviews just like it for Wyman Plumbing can be found right here. Wyman Plumbing Facebook Recommendations, 4 out 5 with 31 recommendations on Facebook. My wife and I use Wyman plumbing for the last 20 years we would not think of using anyone else. – Michael G.
Scott Bradford is the best man for the job! We love Wyman! – Japeth K.
These and many other Facebook Recommendations just like it for Wyman Plumbing can be found right here.